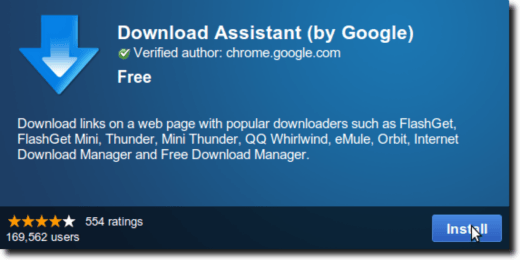 The first thing you’ll need to do is head to the Download Assistant page at the Google Webstore, where you can download and install the extension. Once there, click the Install button. You’ll be asked to confirm the installation, as in order to work, the extension needs to access information on the pages you’re browsing. How can it tell your download managers what to download if it can’t access the page you’re on? Go ahead and click this Install button as well. This will take you to the Chrome Extensions page, where you can see a full list of all the extensions you currently have installed. Scroll down to Download Assistant and click the Options link. The options page allows you to set your default downloader. You can also choose where you want to download files by default, although this can easily be changed for a specific download. Chrome will generally be able to tell if you have one of its supported external download managers (see the page on the Google Webstore for a full list), but if you have one installed – such as SteadyFlow for Linux – you can use the Add More Downloaders section to make Chrome aware of it. You can provide an icon (not necessary), and a name, as well as the command to pass onto your download manager. Once you’re done, click the Add button, then the Save & Close button to save any changes. From now on, when you visit a website that has something you want to download, simply right-click the download link, and choose the Download Assistant (by Google) link, then the download manager you want to use. You’ll be asked where to save your item, and the download will begin. Here we are using SteadyFlow to download a file through Google Chrome. When the download is done, you’ll receive a download complete confirmation from Chrome. Note: in Linux, this only appears if you use one of the Terminal-based download managers, such as wget, curl, aria2 or axel. Using SteadyFlow, as we did, meant we received our notification through it. And that’s it! At the moment, Download Assistant works on Windows, with a wide variety of download managers, and Linux, with a few Terminal-based download managers (and SteadyFlow, with a bit of tweaking). Hopefully someday soon a Mac version will be released, but for now, Windows and Linux users have another option besides Chrome’s built-in downloader.